From his early studies in piano he proceeded, at age 17, to study harmony, counterpoint, and sonata form with Rubin Goldmark, whose staunchly conservative outlook inspired Copland to rebellious investigation of the music of Debussy, Ravel, Mussorgsky, and Scriabin. In 1920, he set out for Paris, modernism's home in the years between the wars. Among the many vital legacies of his stay in Paris were his association with his teacher and mentor Nadia Boulanger; a growing interest in popular idioms; and the insight that there was as yet no American counterpart to the national styles being created by composers from France, Russia, and Spain. He became determined to create, in his words, "a naturally American strain of so-called serious music." As America entered first a Depression, and then a war, Copland began to share many of his fellow artists' commitment to capturing a wider audience and speaking to the concerns of the average citizen in those times of trouble. His intentions were fulfilled as works from Billy the Kid to Lincoln Portrait to the Pulitzer Prize-winning Appalachian Spring found both popular success and critical acclaim. His decision to "say it in the simplest possible terms" alienated some of his peers, who saw in it a repudiation of musical progress -- theirs and his own. 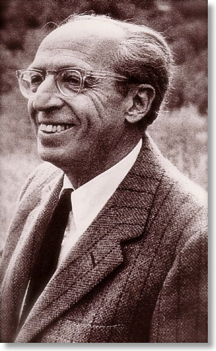 But many who had been drawn to Copland's music through his use of familiar melodies were in turn perplexed by his use, beginning in the mid-1950's, of an individualized 12-tone compositional technique. His orchestral works Connotations (1962) and Inscape (1967) stand as perhaps the definitive statements of his mature, "difficult" style. Aaron Copland was one of the most honored cultural figures in the history of the United States. The Presidential Medal of Freedom, the Kennedy Center Award, the National Academy of Motion Picture Arts and Sciences "Oscar", and the Commander's Cross of the Order of Merit of the Federal Republic of Germany were only a few of the honors and awards he received. In addition, he was president of the American Academy of Arts and Letters; a fellow of the Royal Academy of Music and the Royal Society of Arts in England; helped found the American Composers Alliance; was an early and prominent member of the American Society of Composers, Authors, and Publishers; served as director or board member of the American Music Center, the Koussevitzky Foundation, the League of Composers, and other organizations; received honorary doctorates from over 40 colleges and universities. In 1982, The Aaron Copland School of Music was established in his honor at Queens College of the City University of New York. Please visit this page for information about how to acknowledge the Fund's support and download logos for use.